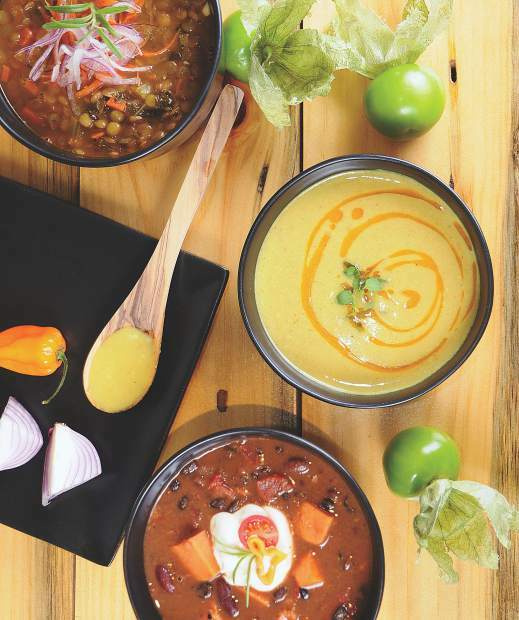 Green Elephant Juicery's lentil vegetable soup, top, spiced cauliflower soup, center, and sweet potato chili. As snow blankets Vail’s hills for the winter season, the pace of life quickens to full throttle. And when cold-weather adventures get added into the mix of an already active lifestyle, choosing healthy food options becomes more important than ever. At its three area locations, Green Elephant Juicery makes healthy refueling easily accessible all day long with to-go breakfast options, unique plant-based snacks, nutrient-packed cold pressed juices, and health-conscious salads, acai bowls, soups, wraps, and smoothies. “A lot of people come to Vail for the skiing and active outdoor lifestyle that’s possible here, and it’s important for us to give back to them the nutrients and good health they deserve for that commitment,” says Green Elephant Juicery Partner and Chief Operating Officer Osha Groetz. To that end, Green Elephant Juicery starts with a basic, but big, commitment to organic and plant-based ingredients. Green Elephant Juicery is known above all for its cold-pressed juices, but with expanded menu offerings, an amazing café in Avon, and services that include daily delivery and subscriptions, juice is only the beginning of an ever-evolving product line. At all locations, you’ll also discover energized staff who mirror the health and creativity that goes into everything they do, from juicing to sharing product highlights. To get the full flavor of Green Elephant Juicery, begin with a visit to its café in Avon for a made-to-order breakfast sandwich and a cup of COLOR Coffee, roasted locally in Eagle. Grab-and-go breakfast options, including breakfast burritos and pre-packaged portions of Mountain Muesli, are perfect for those rushing off to the slopes on a powder day. Masterminded by Chef Hector Martinez, the Mountain Muesli brings steel-cut and rolled oats, almonds, dates, coconut flakes, and crunchy apples together in a comforting, creamy almond-milk base for a morning meal that’s high in protein. The Avon cafe’s vibrant space invites guests to settle in and share a meal of fresh-made soup with a friend or to have an Acai Bowl lunch break with a colleague. Mid-afternoon lulls can also be remedied with a juice or snack stop at any location. Green Elephant’s cold-pressed juices are beloved and known for their exciting flavor combinations that can’t be found elsewhere, including four different green juices and the S.P.O.T. Treatment that contains orange, pineapple, sweet potato, and turmeric root for a revitalizing combination. Master Juicer Pepe Ramos oversees Green Elephant’s cold-pressed juicing process, from which the freshest possible, nutrient- and enzyme-bursting juices are extracted. With no heat involved in the process, the result is a concentration of vitamins, minerals, nutrients, and enzymes in every sip. All of Green Elephant Juicery’s locations are poised to achieve its mission of making healthy eating easy, and with sweet treats such as the plant-based Crazy Choco Nutty Cups, stopping in for a snack can turn into an adventure in healthy eating.